This month, Chinese New Year celebrations will take place across the globe, celebrating the arrival of a new Lunar Year – Year of the Dog. Falling on Friday 16th February, many Chinese New Year celebrations will continue into the weekend, with plenty of official celebrations taking place in central London on Sunday February 18th (including an annual parade). Naturally, food is a huge part of Chinese New Year, with many Chinese and East Asian families using the time to cook and eat together, preparing unique dishes such as longevity noodles and prosperity dumplings. Here in London, we’ve come a long way from DayGlo pork and lacklustre ‘all-you-can-eat’ buffets. The city is now home to some of the best Chinese food available in the Western world. From traditional Cantonese fare to Michelin starred contemporary openings offering something a little different: these are the best Chinese restaurants in London. Opened in 2012, A Wong went on to receive a Michelin star with the publication of last year’s guide. A humble space with light wood furnishings and a loud open kitchen, A Wong offers a 10-course ‘Taste of China’ menu (paying homage to China’s 14 national borders), and an innovative ‘Peking Duck Feast’, alongside an a la carte menu. The main draw at lunch, however, is the restaurant’s contemporary dim sum, available per-piece. Interpretations of classic siu mai and har gau are tastefully traditional, as are the Shanghainese siu long bao filled with hot soup rife with plenty of ginger. Elsewhere, wild mushroom and truffle steamed buns resemble baked potatoes but have tremendous depth of flavour, while the sweet custard buns are filled with an unctuous salted duck egg custard: sweet, savoury and outrageously decadent – it’s impossible to order just one. Further information on A Wong can be found here. Re-launched at the end of last year, following an extensive refurbishment, Courtesan boasts an all-female chef team, under the leadership of Feng Juan Xue. The restaurant’s entire wine and spirits list also focuses on drinks produced or grown exclusively by women. On Atlantic Road in Brixton, Courtesan is dark with candlelight, dark wood panelling and velvet booths, and focuses primarily on dim sum. Here, the menu is updated regularly with dim sum and bao, plus noodle and rice dishes based on China’s ancient techniques, yet updated with modern ingredients from around the world. Dishes may include the likes of steamed dumplings with fresh king prawn and wasabi, turmeric-spiced bao buns filled with Gujarati-spiced pumpkin, or deep-fried frogs’ legs in a light batter dusted with chilli powder. Further information on Courtesan can be found here. Operating from a unit in Pop Brixton, duck duck goose was set up by London-born Oli Brown, inspired by his time living and working in Hong Kong. At duck duck goose, the main focus is on barbecued meats, all of which are air-dried and roasted in the on-site custom built air dryer and duck oven. As expected, the restaurant’s Peking duck is absolutely sublime. (The restaurant also serves Peking goose on Saturday evenings.) Then there’s that ‘Prawn Toast Revisited’ – heavily inspired by a similar dish served at Ho Lee Fook in Hong Kong. A far-cry from the often Anglicised version we’re used to in the UK: white bread sandwiches a portion of prawn mousse so generous it bulges from the fried bread covering. 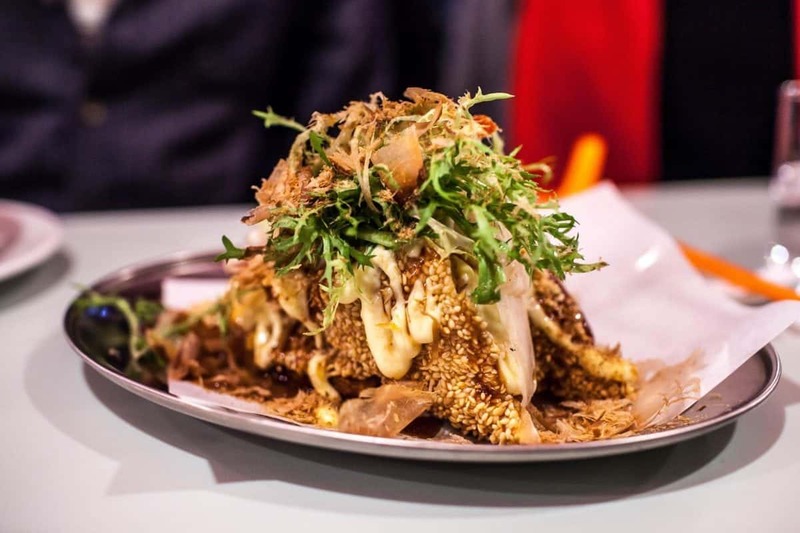 The extra surface area also allows for the addition of considerably more sesame seeds, dressed with tonkatsu sauce, kewpie mayonnaise and a heavy-handed sprinkling of bonito flakes. This is comfort food at its absolute best. Further information on duck duck goose can be found here. 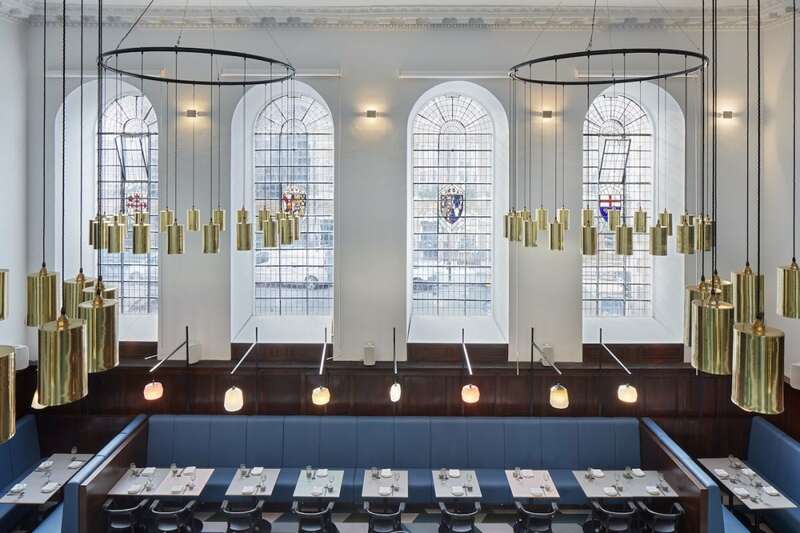 With a Michelin-starred restaurant in Hong Kong, Duddell’s opened in London last year, taking over the former St. Thomas’ Church near London Bridge station. Inside, the lofty space is attractively decorated with a pallet of deep blue, mahogany panelling, brass chandeliers and a striking geometric floor. 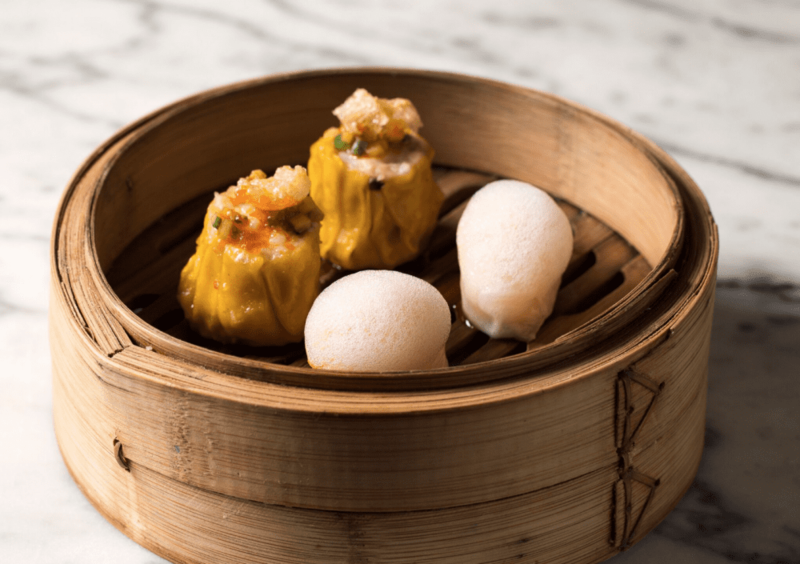 Like the Hong Kong original, the Duddell’s London menu has an unequivocal fine dining approach, with Head Chef Daren Liew having previously worked for the Hakkasan group. At lunch, an extensive dim sum menu is offered, though the dumplings available during evening service are slightly underwhelming. Instead, Peking duck is the main draw, served in two courses. The first features brittle duck skin so shiny it looks as though doused in hairspray, joined by a huge selection of accompaniments including transcendent fennel-spiked sugar. This is followed by a portion of stir-fried duck in a choice of three sauces: Martell black pepper, truffle, or spring onion and ginger. Further information on Duddell’s London can be found here. 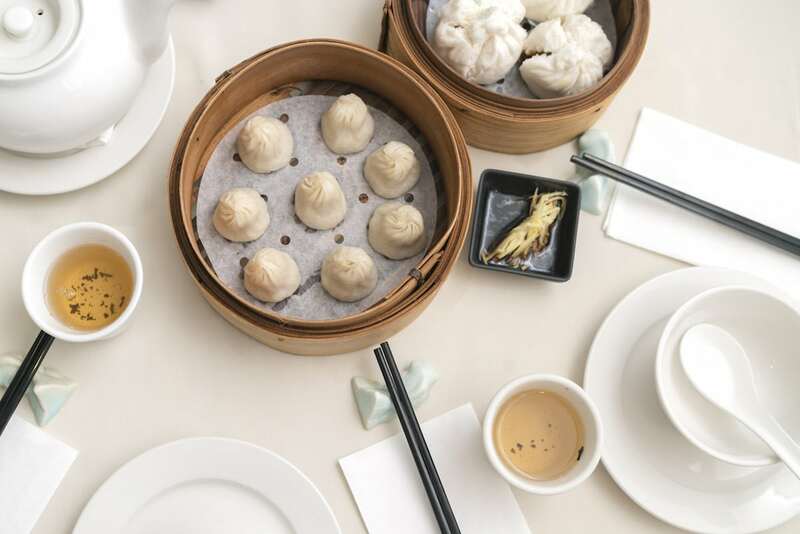 Owned by restaurateur Geoffrey Leong, whose family have founded many Chinese restaurants since the 1980s, Dumplings’ Legend’s charm lies within the food served. Here, the service isn’t exactly unfriendly, but nor is it warm, and the dining room’s fluorescent lighting isn’t particularly comforting. The food, though, is generally very good. Like many Chinese restaurants, Dumplings’ Legend’s menu seems almost as long as the great wall, featuring typical Cantonese dishes we’ve become accustomed to in the UK, while various avenues of regional Chinese cooking are explored with great competence. 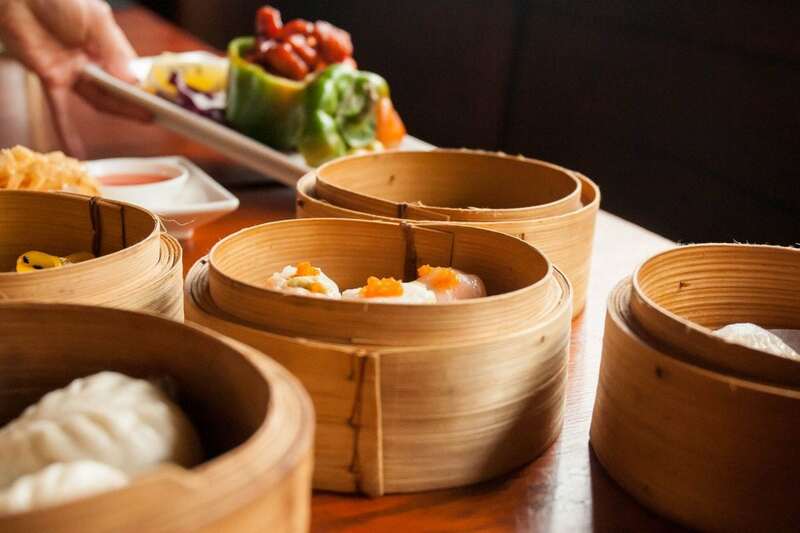 As the restaurant name suggests, Dumplings’ Legend serves some of Chinatown’s best dim sum, as well as offering some of Gerrard Street’s best value. Further information on Dumplings’ Legend can be found here. 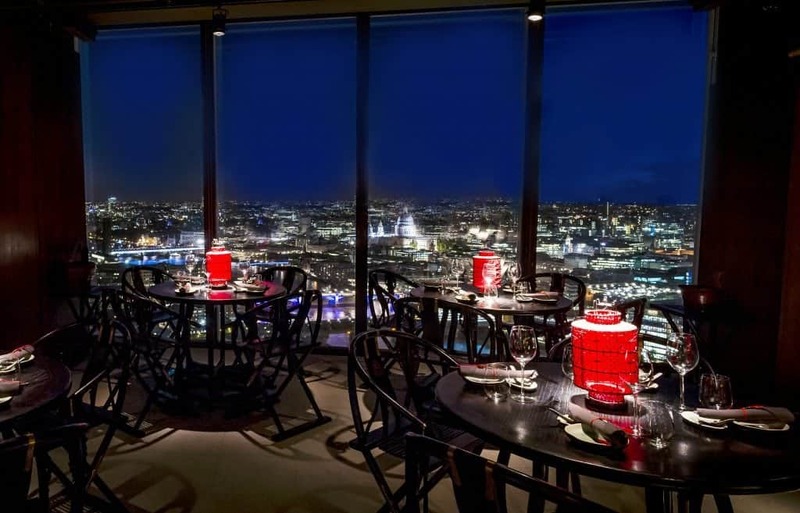 Although one of London’s more expensive Chinese restaurants, Hutong also offers sweeping views across the city. On the 33rd floor of The Shard, Hutong opened in 2013, based on the Hong Kong original. Here, traditional Chinese décor is offset by ubiquitously modern floor-to-ceiling windows, while the restaurant menu has a particular Northern Chinese slant. Soon after opening, signature dishes such as Peking duck and the ‘red lantern’ crispy soft-shell crab with Sichuan dried chilli quickly became popular – and unsurprisingly so. To celebrate Chinese New Year, Hutong are currently offering a special menu featuring dishes such as Ma la beef tenderloin, konnyku and sweet chilli Chinese yam; king prawn dumpling with hot and sour soup; whole sea bass with spicy garlic sauce; aforementioned ‘red lantern’; Chinese five spiced crispy duck; sweet New Year’s sticky milk cake, and more. Further information on Hutong can be found here. At the heart of an impressive Chinese community, Royal China opened on Queensway in 1996. Since then, another six restaurants have opened from the group (plus one in Singapore), including a fine dining restaurant in Marylebone. At the Queensway original, the 130 cover space has recently been renovated, but retains its typical 1990s décor. 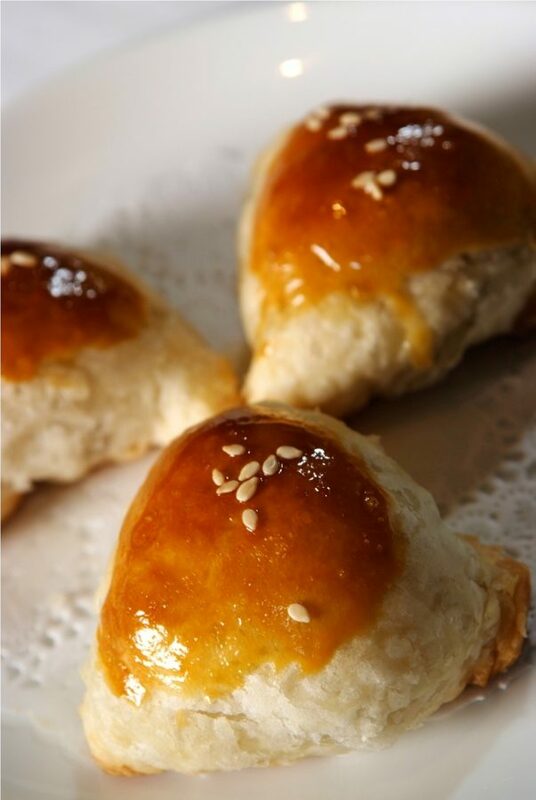 At lunch, Royal China serves a notable dim sum menu, which is possible to enjoy in less than an hour. 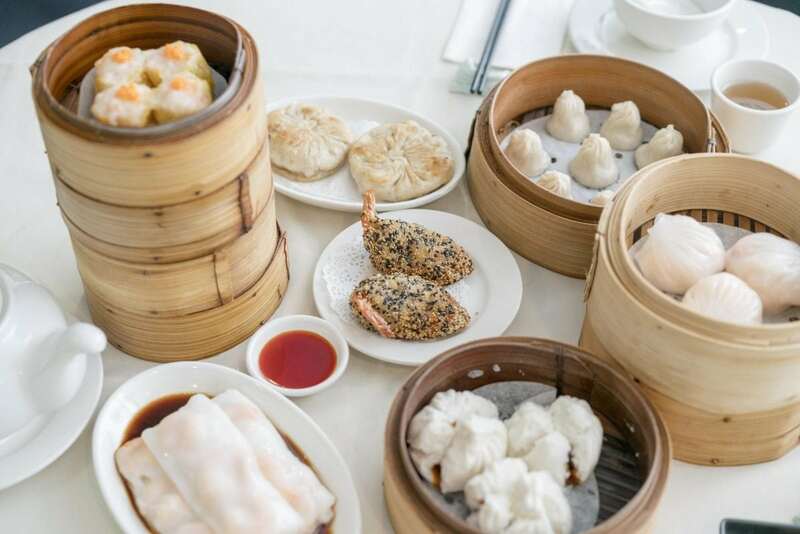 Classic dim sum dishes include fine takes of siu long bao, pork and prawn siu mai, plus superlative fried yam puffs and honey roast pork puffs dusted with sesame. The chicken feet in black bean sauce and the Chinese sausage rice pot are additional must-try menu items. Further information on Royal China can be found here.